John Momis was declared President of the Autonomous Region of Bougainville on Saturday morning. He was declared president after obtaining more than the absolute majority votes of 51, 1000. He collected 51,382 votes after the fourth elimination which was well over the absolute majority. The president elected accepted and signed papers declaring him the seat of the President for the next five years. After signing the documents from the Bougainville Electoral Commission, Chief Momis thanked the people of Bougainville for having the faith in him to lead the team that would get them into the future. Chief Momis also thanked the candidates who stood for the 2015 election for their commitment to contribute to the process of peace building on Bougainville. 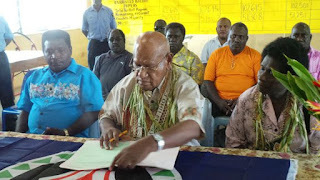 He promised to work with all factions of the community to make sure Bougainville is geared for the coming Referendum that will decide the Political status of Bougainville once and for all. President Momis also congratulated the people of Bougainville for making sure that the election was done in a fair and free way. He said despite our differences we can work together for the common good for the people of Bougainville. DR. Momis also congratulated the Electoral Commissioner, GEORGE MANU, for delivering as expected and on time.